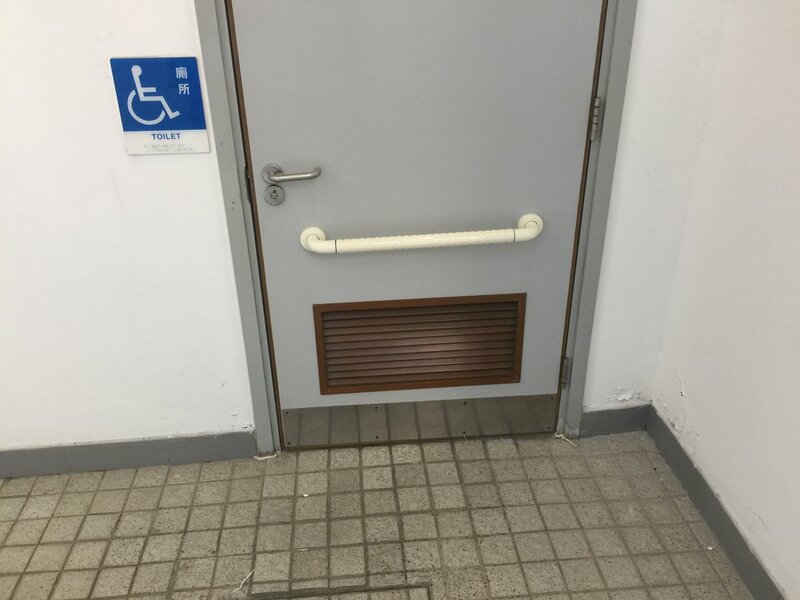 Recently on a trip to Hong Kong and Kowloon in China I used a public toilet room and noticed several differences in their disability installations. The photo to the right is the door to the Men’s Room. There are some differences in how this door is installed in the US. Can you spot them? First, you may see the white grab bar across the front of the door. While not required in the US, this could be a very helpful installation for disabled people who use a cane or walker versus a wheel chair. Also, you may notice that the bar is installed relatively low to the finished floor. Second, it may not be obvious but their sign on the left of the door is installed lower than we see in the US. This installation height, as well as the height of the grab bar, may be related to the relatively lower heights of the people in China versus the US. The photo below is a closeup of the lower half of the door. Third, in the first photo above look above and slightly to the left of the door and you will see an emergency signal generator. This is a signal generator that can be activated by a switch inside the toilet room. See the photo below for a picture of the switch inside the toilet room and between the toilet and sink.